This is how fast it can happen. On a mild January day, Mini – my 12 -year old miniature pinscher (or “Min Pin”) – was running around the house like crazy. Life with a toddler is busy, and I told Mini that I was sorry I had not been more attentive recently, and that I would take her for a well-deserved hike the next day. The next morning, due to the general commotion that is most of our mornings, it took me almost half an hour to realize Mini hadn’t enquired about her breakfast. I ran upstairs, heart in my throat, to find Mini curled up on the bed, not wanting to move. My heart sank even further when I picked her up, put her on the ground and saw she was not putting weight on her right front leg. Of course I examined her; I was shocked and dismayed to find a previously unnoticed mass on her right shoulder. We immediately took her into our hospital, and a few hours later, we had x-rays (radiographs) showing signs of cancer in her humerus (upper bone of the front leg). As it was in Mini’s case, radiographs of the affected leg are often highly suggestive of the diagnosis and biopsies are not always necessary. The radiographs were reviewed by surgeon Dr. Kuzma and he also suspected osteosarcoma (OSA) so we knew from the beginning that this would be an aggressive cancer that has a tendency to spread (metastasize) rapidly. Most dogs with OSA are considered to have metastasis at the time of the diagnosis which is why following up with chemotherapy is so important in addition to addressing the primary tumor. The generally recommended treatment for this type of cancer is amputation and then chemotherapy. During the next week, we staged the cancer. Staging (or clinical staging) means determining the extent of the cancer. Blood work, urinalysis and CT scans were all done. CT is commonly used in human medicine for tumor staging as it has been proven to be better than radiographs both in veterinary and human medicine. 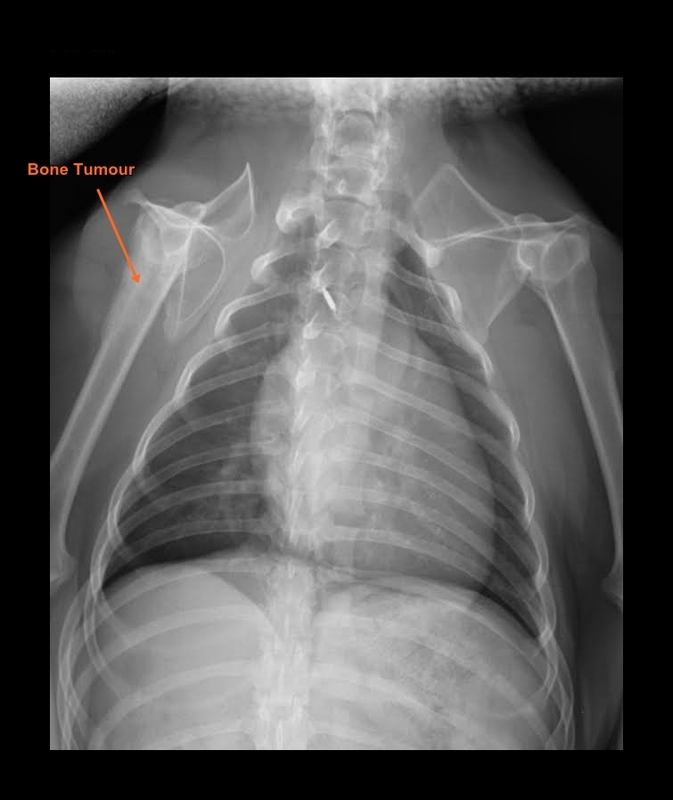 Radiographs almost always underestimate the extent of cancerous lesions. Under oncologist Dr. Saam’s watchful eye, radiologist Dr. Mareschal then conducted a procedure called a fine needle aspirate – using ultrasound to guide a needle into the tumor. While this approach is not as “diagnostic” (i.e. – we may not get the answer as easily as we would with a biopsy), it is less invasive. Additionally, bone biopsies can cause intractable pain and should only be done when the diagnosis needs to be confirmed prior to an amputation. The fine needle aspirate procedure confirmed our preliminary diagnosis – Mini had osteosarcoma. Amputation is the recommended treatment for dogs with this diagnosis, but I felt that it wasn’t a good option for Mini. Although she is a small dog and they typically do well with amputation, Mini has chronic disc problems in her neck. As a result, I worried that the jarring of a 3-legged gait might create the need for further neck surgery. I wanted to consider other potential options. Dr. Saam told me that while she has been unimpressed with the results of traditional palliative radiation therapy, one of her patients had done extremely well with Stereotactic Radiation Surgery (SRS), also known as “cyberknife”. This option is not yet available in Canada, but over the next few days I learned a lot about this new technology, the rationale for it, and the options it can provide. 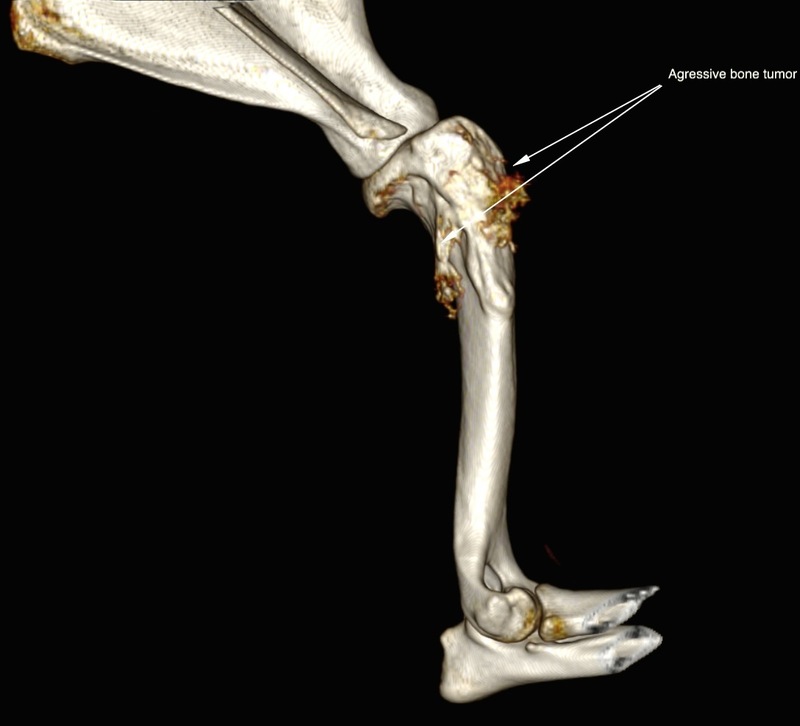 You can learn more on this topic from these excellent blog posts by New York veterinary oncologist Dr. Ettinger: Osteosarcoma and Amputation Myths and Facts, Osteosarcoma – When Amputation is Not an Option and Cyberknife Radiosurgery in Pets. There are currently a handful of cyberknife facilities for animals in the United States. I spoke at length with Dr. Charney, the radiation oncologist who plans all the cyberknife radiation treatments for the Radiation Oncology Department at the Animal Specialty Center in Yonkers, New York. The CT scan was used to ensure that no aspect of her humerus had more than 50% destruction of the bone by the tumour. This is done by mapulating the images of the CT into very thin slices of the bone (0.5mm) and examining each slide for the absence of more than 50% destruction. If the tumour had caused more extensive damage than that, Mini would not have been a good candidate for this type of treatment as it could weaken the remaining intact bone and make it prone to fractures. Thankfully, the bone destruction in Mini’s case was under the 50% threshold. I felt very comfortable with her proposed treatment and after much discussion with my husband about the options, the costs, and the potential outcomes, we decided that cyberknife treatment would be the very best option for Mini and for our family. We commenced making plans to have Mini take a trip to the Big Apple.